We show below just a few highlights from our events and fundraising over the recent years. 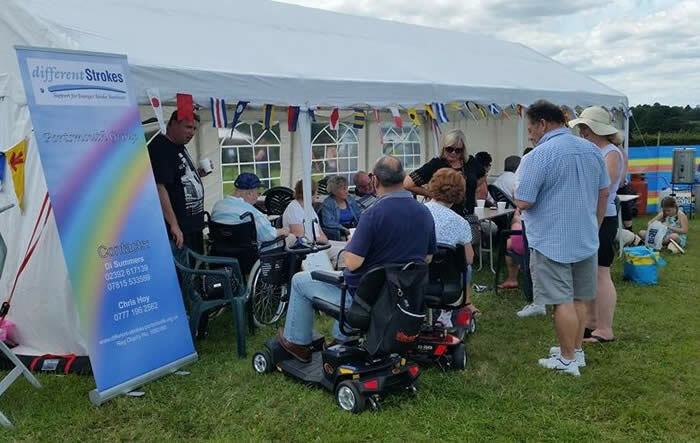 Saturday June 27th saw some of our members join in with West Sussex Centre Caravan Club's Charity Fete in Ebernoe (near Petworth) in aid of Different Strokes Portsmouth. The club selected us as their current charity after one of their long time members, Maureen (Mo) Brown had a stroke a couple of years back. Maureen was supported, and still continues to receive support, by being a group member of Different Strokes Portsmouth and the Caravan Club wished to show their appreciation of the work we do and the difference we can make. The fete included all day events and evening hog-roast and raffle. As you can see, the weather was picture perfect and a great day was enjoyed by all. West Sussex Centre Caravan Club expect to make their donation to us towards the end of 2015. Two friends, Madelaine Page and Sharon Mapleston, together raised £2,200 by holding a Las Vegas-themed night and presented us with their cheque at our Christmas meal and disco on 12th December. They were inspired after their friend and co-worker, Julie Alp, was supported by Different Strokes Portsmouth after her stroke in May 2010. Julie has continued towards full recovery and the pals wanted to express their gratitude to the charity. The event transformed Milton Village Hall in Southsea with casino tables, a photo booth, a disco and a raffle. Guests paid £20 for a ticket, which included £150 fun money to be used at the betting tables. The donation will be used towards funding a MOTOmed VIVA2 exercise machine. Solent Motorcycle Club once again raised funds for our group, not allowing the weather to dampen down their All-Day-Rally at Fort Purbrook which was attended by members from our group. Over £400 had been raised by SMCC during their Winter Rally in January and on the 7th September, the sum was raised to a magnificent £1,013 due to the astonishing generosity of the bikers. Thank you enormously, Solent Motorcycle Club, for your mighty achievement. Southwick Park Ladies Golf Club had very kindly chosen Different Strokes Portsmouth, as the charity to support during 2013, and on this occasion, held a General Knowledge Quiz & Barbecue. Commencing around 7pm and the packed evening's programme carried on to aound 11.30pm. This highly entertaining event was a mighty success and the funds raised will be added to over the full period of the current ladies' captain's tenure. Our thanks to all the members of Southwick Park Golf Club who assisted on the night. Well done, all of you. We, in Different Strokes Portsmouth, combined with our friends in Different Strokes Southampton to raise money for both of our groups. The events took place on Saturday 18th May 2013 in Portsmouth and Saturday 25th May 2013 in Southampton (Eastleigh). Initially, the challenge was to climb enough steps to equal the height of Mount Snowdon. Under supervision, stroke survivors used a step-box and their steps were counted. Carers, friends, families and supporters added to the counted steps by ascending the stairs to the spectator levels above, some doing this many times over. Because of the large number who turned up to make the 'ascent' the Snowdon challenge was achieved in a few hours, so in the remaining time we decided to tackle Ben Nevis too and our efforts were then carried over to the event in Southampton where this additional challenge was completed. It must be said the stroke survivors were superb and their efforts were a major contribution which made this a hugely successful fundraising achievement. Funds assist in supporting stroke survivors in their physical and mental ehabilitation, in re-establishing social connections, in providing information about and access to support services and structured support to stroke survivors and carers, via, gym rehabilitation, access to neuro physiotherapy, regular group meetings and social events. The overall total received was split equally between the Different Strokes Portsmouth and Southampton groups. Terri Mayes took part in this year’s BUPA run. This was the second year she has done this to raise Funds on our behalf. The overall amount raised on behalf of our group, in conjunction with John Cheetham's golfing friends, was £275.00. Well done everyone concerned! We attended this special Fund raising event and were very fortunate to have their wonderful Management and Members raise £246.40 for our Group; this amount included monies that their club members had won earlier in the evening! How about that for human kindness? Well Done! Charlotte Land, an Occupational Therapist (daughter of the late John Land), and her work colleagues held a fund-raising event for our group. On 1st October we were presented with a cheque for an amazing £380.00 by Charlotte’s lovely mum, Gill Land. We sincerely thank you all. Solent Motorcycle Club held a charity fund-raising event during their All-Day-Rally in Fort Purbrook. From a combination of initiatives such as cake stall, motor cycle equipment and memorabilia and a Raffle for various prizes they raised for our group handsome sum of £727.00. Claire Warburton completed the Virgin London Marathon in a time of: 4 hours and 30 minutes, despite leg and hip discomfort! Well done Claire – we’re proud of you. As at 30 October 2012 the total raised stood at £1,009.90. We've bust the thousand mark! We are eternally grateful for the excellent support many generous spirited people. The Seal sisters, (A medic and two physios) Nicki, Bekki and Kay tackled Mount Kilimanjaro via the ‘Rongai Route’ on an 8-day climb. They funds for us in the Portsmouth Group and also for a hospital in Malawi. excellent pictures of the occasion. and our instructor, Claire Warburton. Right: Andy Long tries out the MediMotion machine; pictured with C laire and the Centre Manager. Below: Claire crouches before a long line of new equipment that was funded by Portsmouth Council of Community Services. Claire Warburton has done so very much for the rehabilitation, welfare and health of our group. We are all extremely grateful. It was Claire who applied-for and received both the funding for us to take part in gymnasium exercise on a GP Referral Scheme; and the purchase of state-of-the-art equipment. We salute you! Nicola Binning, having already taken part in a gruelling London mini-marathon (an open-water Docklands-swim,cycle and run) later crewed in the 605 miles August 2009 Fastnet Race. 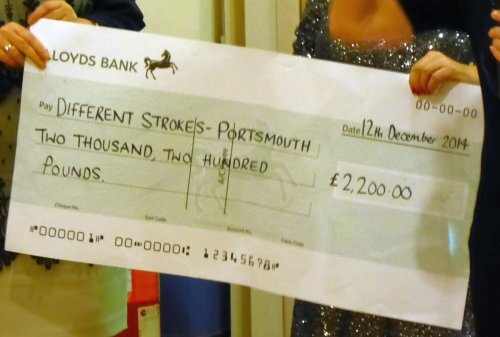 In total she raised over £1,400 to be shared equally between Different Strokes HQ and Different Strokes Portsmouth. Andy Long featured in world-wide feature article. You can read more about this in the Media Articles section of our Links page. The Secret Millionaire came to Portsmouth - the programme was first broadcast on Wednesday 5th December 2007, Channel 4 and repeated later on Tuesday 11th December. Posing as a volunteer, Mr David Pearl, one of Britain's richest men attended a Different Strokes seated mobility session and joined in all the exercises with enthusiasm. He also participated in our swimming sessions and enjoyed a drink with us at The Golden Hind Public House, our 'local' and regular social evening meeting place. David was so ipressed with our efforts that he made a large donation helping us to assist those struggling to pay for transport to attend our activities and also to pay for the hire of instructors and venues. This has proved to be a great success; especially in expansion of the numbers attending the exercise classes. All in all; the availability of David’s money has certainly moved Different Strokes Portsmouth on to ‘better things’. We are now more widely known, locally and afar, not least because of our website which with the help of his funding we became able to afford to set up maintain.